With so much of our food grown miles away and imported year-round it’s no surprise that we can buy peaches in December and brussels sprouts in June. But why would you want to? A December peach is usually pale and crunchy. A June peach from a nearby farm, on the other hand… that’s a sweet and juicy treat. 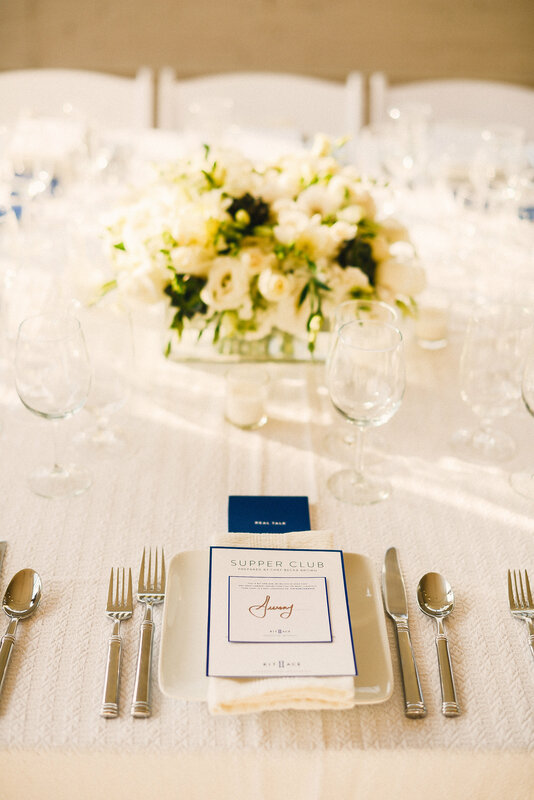 A few weeks back, I planned a monthly supper club menu for Kit & Ace (creators of amazing cashmere clothing), using as many local and seasonal ingredients as possible. I gave them a few options for each course, incorporating produce, meat and cheese that met the request, and left them to drool away. 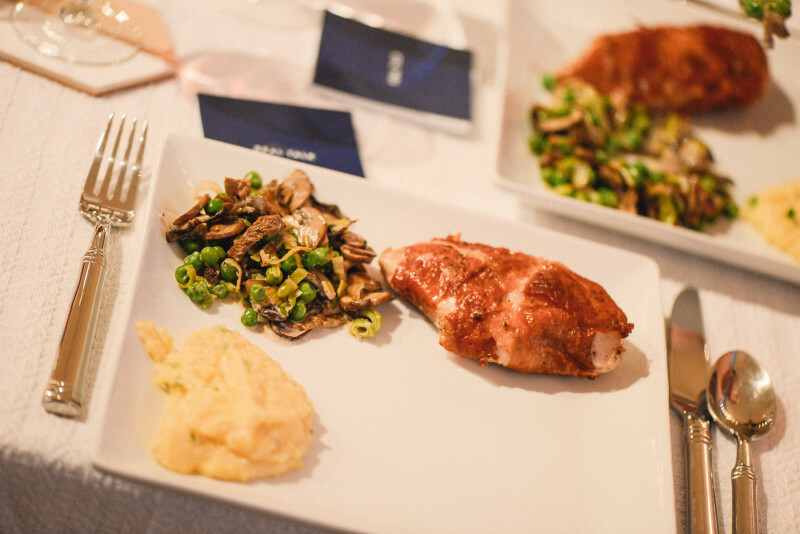 They selected a menu featuring spring peas, mint, and peaches, as well as chicken breast, burrata and goat cheese. While I took care of the food, they took care of the rest. 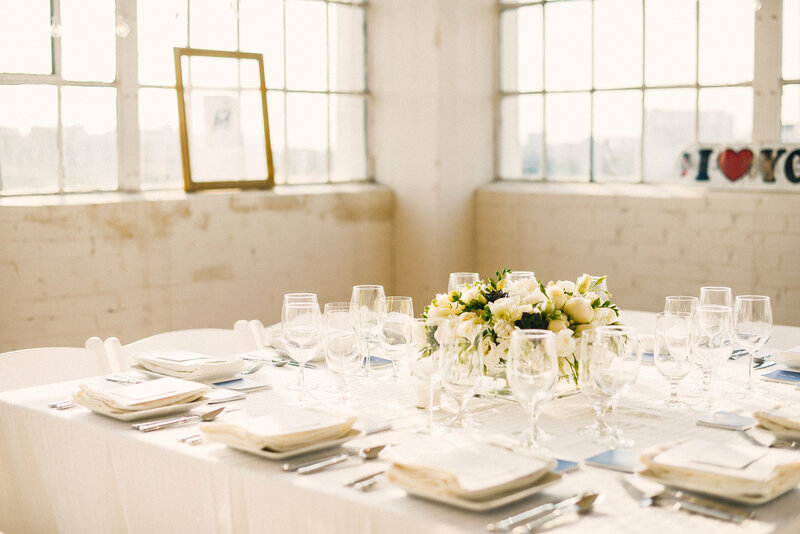 The dining table was a beauty to behold. Of course, eating seasonally and locally doesn’t come without adventure. My first procurement stop was Urban Acres, a food co-op of sorts in Oak Cliff which grows much of their produce on site and sources other offerings from nearby farms. It turns out they had a refrigeration problem overnight and lost almost all of their produce. At least I was able to pick up some Windy Meadows chicken breasts while I was there. Plan B for produce: I called Ham Orchards out in Terrell to track down some peas. Unfortunately, I was told, all of the spring rain and flooding we experienced drowned out many of the pea crops throughout North Texas and they’d be nearly impossible to find anywhere. As a result, I had no choice but to go with sugar snap and snow peas from California. While eating local doesn’t have the predictability that the grocery store offers, my search for peas gave me a deeper appreciation for the steps involved in getting locally-grown produce onto the dinner table. I was, however, able to get my hands on many beautiful bunches of mint from Generation Farms, located in Rice, TX. Gently buzzed up with a few toasted almonds and some extra-virgin olive oil, the mint was a refreshing palate pleaser in my resulting pesto. And let’s not discount our cheeses. Sure, when in France, track down an amazing roquefort. But here in Dallas, we’ve got some really great options to support our local producers. I stopped in the Mozzarella Company and they were kind enough to let me sample many of their 20 cheese offerings. 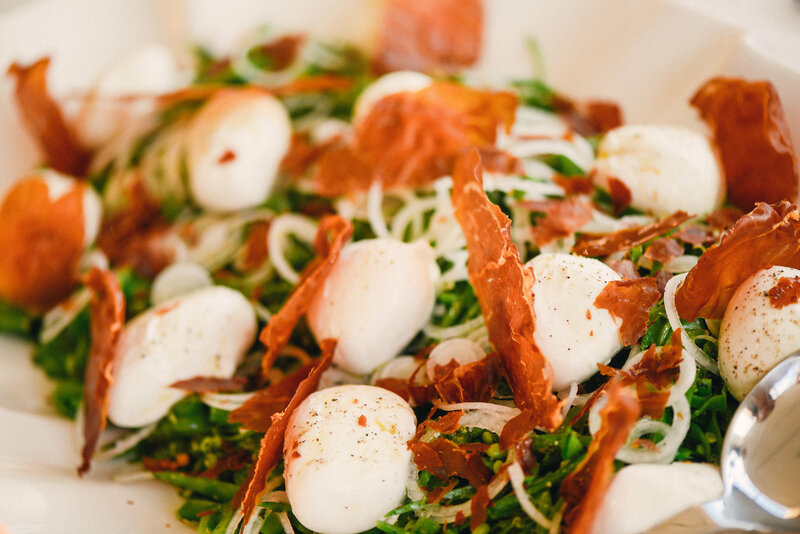 The burrata con crema, though… that cheese! 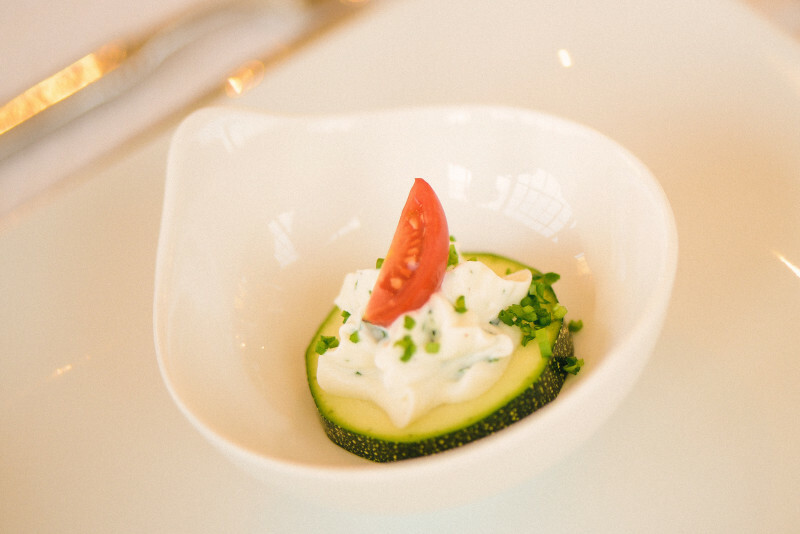 Smooth on the outside, just like you’d expect from a mozzarella, but oozing with silky creme fraiche upon breaking open that perfect little ball of joy. Had to have it. Pairing it with the peas, mint pesto and a little crispy prosciutto made for a vibrant first course. As a cheese lover, I couldn’t settle for just one. On Pure Ground’s classic chevre was the perfect cheese not only to make into a mousse for the zucchini amouse bouche but also to whisk into my polenta for the main course; smooth and creamy, but slightly crumbly, with that beloved tang of goat’s milk. And for the finale, the peaches. With a narrow window for perfect peaches, we were lucky enough to be right in the middle of it. The peaches from Cooper Farms, located about an hour south of Dallas, were sensational. 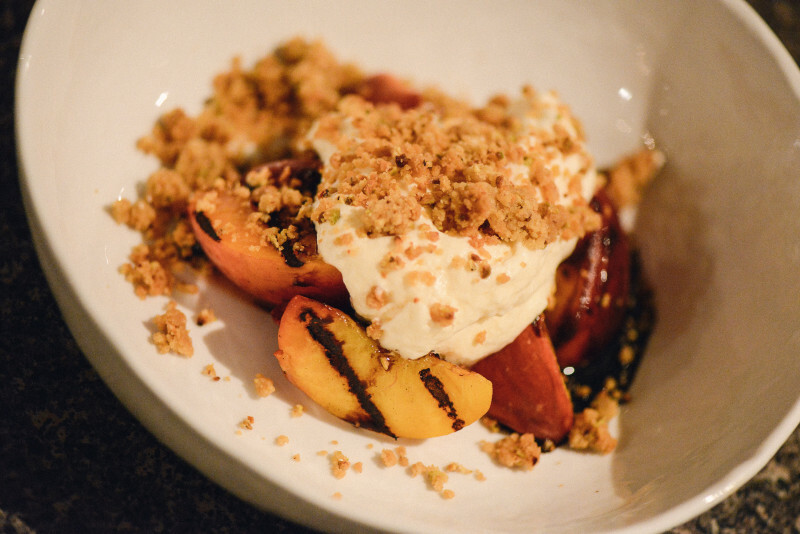 Grilled and presented with a whipped mascarpone cream, aged balsamic vinegar and sweet-yet-salty pistachio crumble, the peaches exceeded expectations. Sweet with a slight tang and, most of all, deliciously juicy beyond compare. It pays to go local.